"Who is this guy, mom?" A24 has unveiled the first official trailer for an indie drama titled Gloria Bell, the latest film from acclaimed, hard-working Chilean filmmaker Sebastián Lelio (who received international acclaim for A Fantastic Woman, and also directed Disobedience, now remaking his own 2013 film). This romantic comedy, which premiered at TIFF recently, is about a free-spirited woman in her 50s who seeks out love at L.A. dance clubs. Starring Julianne Moore as Gloria, with a cast including Alanna Ubach, Jeanne Tripplehorn, Sean Astin, Michael Cera, Brad Garrett, and John Turturro. Described as a "sophisticated romantic comedy that shows love can strike at any time, relationships are never simple, and nothing can get you down as long as you keep dancing." Yes, that is actually some superb advice. Dancing rules. I've been hearing lots of great buzz about this, and damn does it look a very good time at the movies. Gloria (Julianne Moore) is a free-spirited divorcée who spends her days at a straight-laced office job and her nights on the dance floor, joyfully letting loose at clubs around Los Angeles. After meeting Arnold (John Turturro) on a night out, she finds herself thrust into an unexpected new romance, filled with both the joys of budding love and the complications of dating, identity, and family. 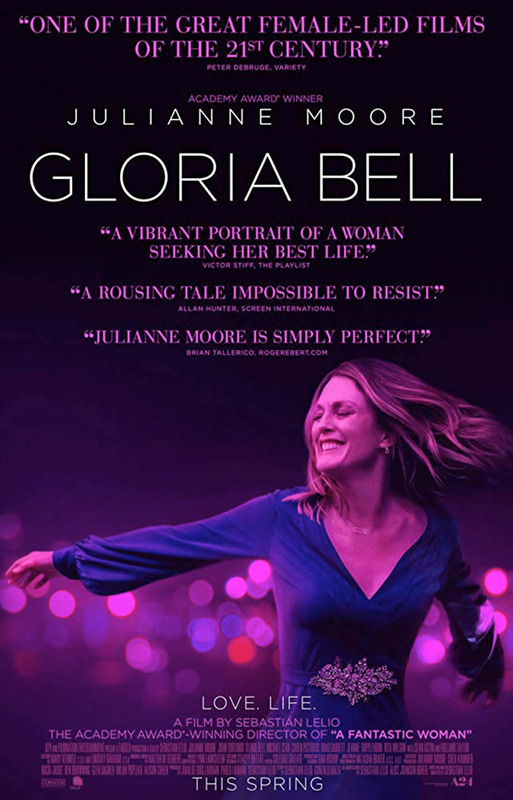 Gloria Bell is directed by Chilean filmmaker Sebastián Lelio, director of the films The Sacred Family, Christmas, The Year of the Tiger, Gloria, A Fantastic Woman, and Disobedience previously. The screenplay is written by Alice Johnson Boher, and Sebastián Lelio - an American remake of his own 2013 film Gloria, which starred Paulina García. This premiered at the Toronto Film Festival earlier in the fall. A24 will release Sebastián Lelio's Gloria Bell in select theaters starting on March 8th, 2019 early next year. Anyone interested in watching? Thoughts?